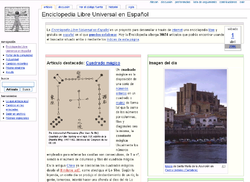 Enciclopedia Libre Universal en Español (English: Universal Free Encyclopedia in Spanish) is a Spanish language wiki encyclopedia, released under the Creative Commons Attribution-ShareAlike License 3.0. It uses the MediaWiki software. It started as a fork of the Spanish Wikipedia. The downloadable database dumps of Wikipedia content were highly outdated. Wikipedia was hosted on a .com rather than a .org domain. In 2011, Enyedy said that the sole reason for the failure of Enciclopedia Libre Universal en Español as a long term project was because it "was not intended to last. It was merely a form of pressure. Some of the goals were achieved, not all of them, but it was worth the cost." In 2011, Enyedy said "Nowadays, the romantic point of view is that EL survived and is still going strong." He argued that while the viewpoint is positive, it is not factual. 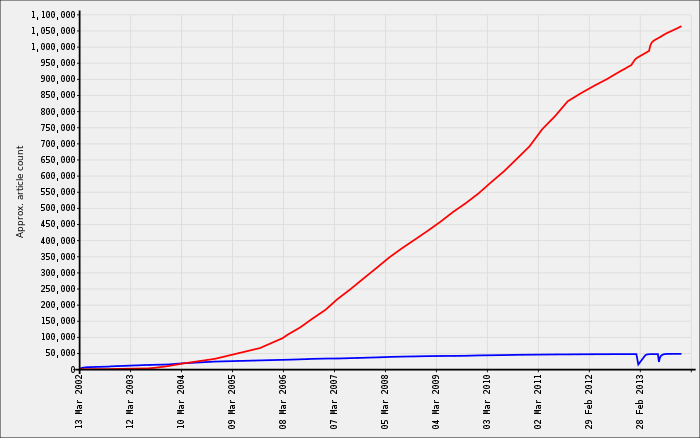 While Enciclopedia Libre initially grew much more rapidly than the Spanish Wikipedia, the Spanish Wikipedia overtook it in 2004. Since then, the Spanish Wikipedia has grown at a much greater rate. As of December 2016, the Spanish Wikipedia hosts approximately twenty-six times as many articles as Enciclopedia Libre. ^ "Lista de usuarios activos". Enciclopedia Libre Universal en Español. Retrieved 2015-08-24. ^ Tkacz, Nathaniel (20 January 2011). "The Spanish Fork: Wikipedia's ad-fuelled mutiny". Wired UK. ^ Lih, Andrew (2009). The Wikipedia Revolution: How a Bunch of Nobodies Created the World's Greatest Encyclopedia. London: Aurum. p. 9. ISBN 9781845134730. OCLC 280430641. ^ a b c Tkacz, Nathaniel. "The Spanish Fork: Wikipedia's ad-fuelled mutiny." Wired. 20 January 2011. p. 2. Retrieved on 26 June 2013. This page was last edited on 13 December 2018, at 08:47 (UTC).